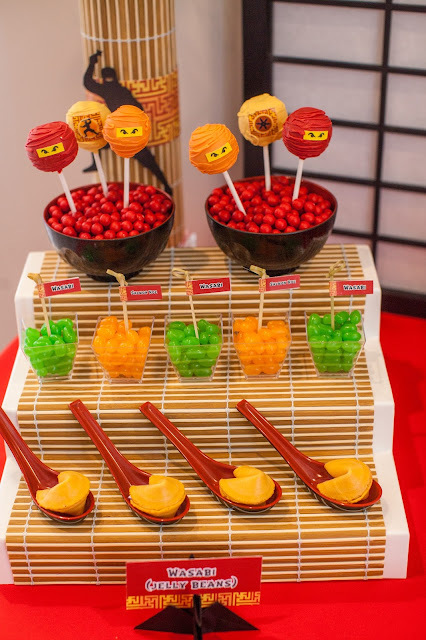 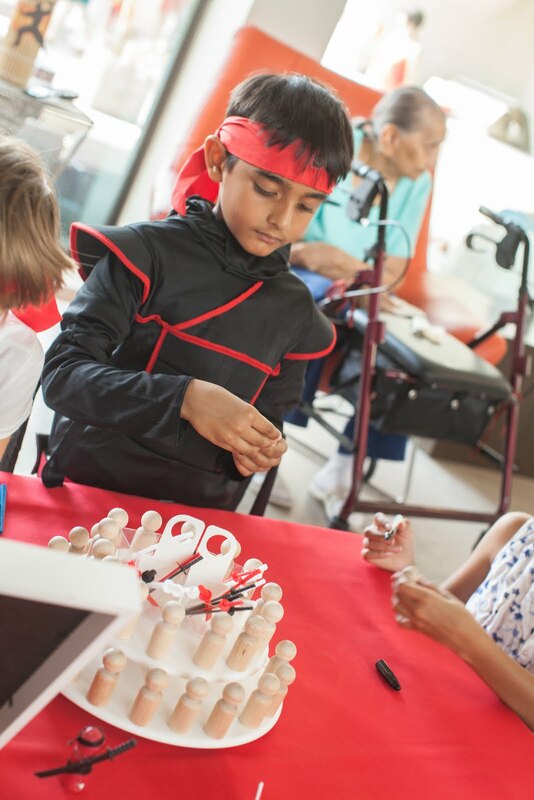 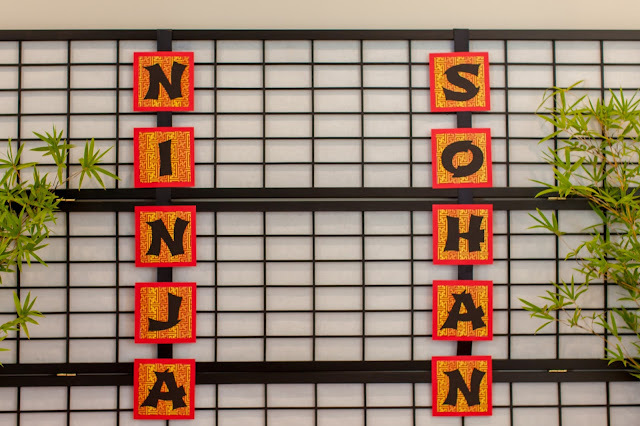 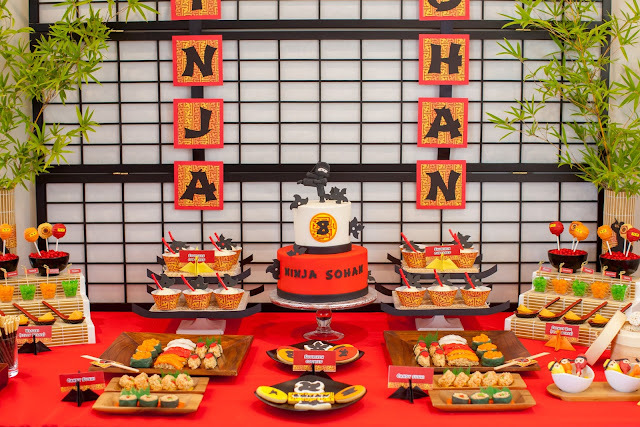 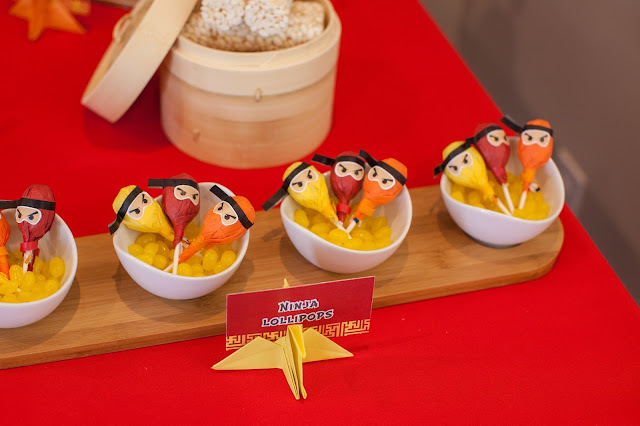 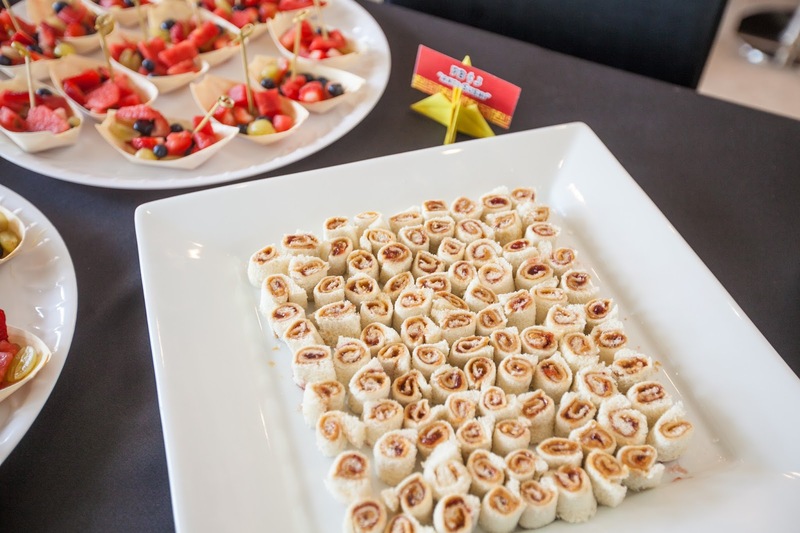 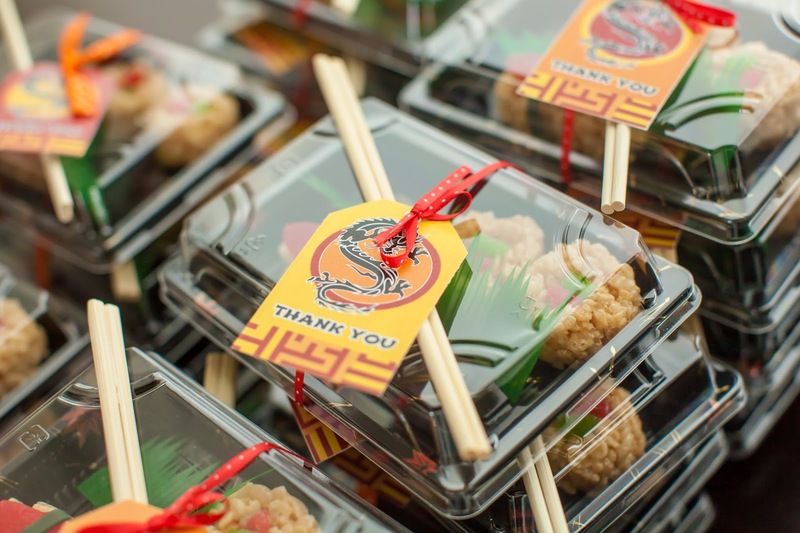 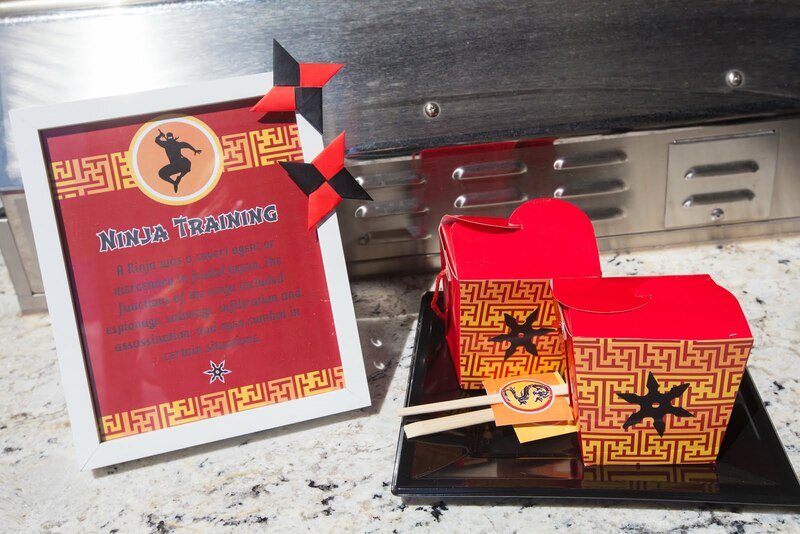 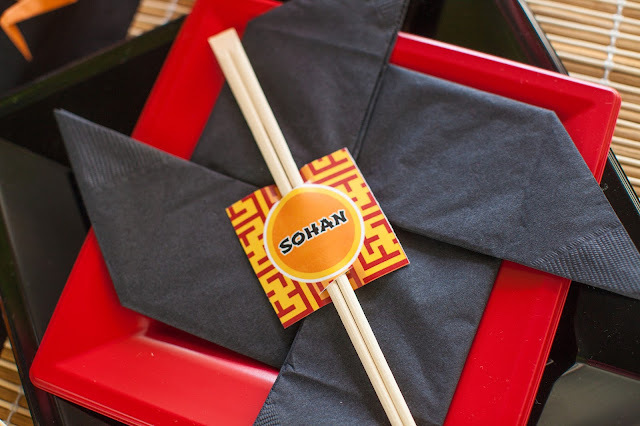 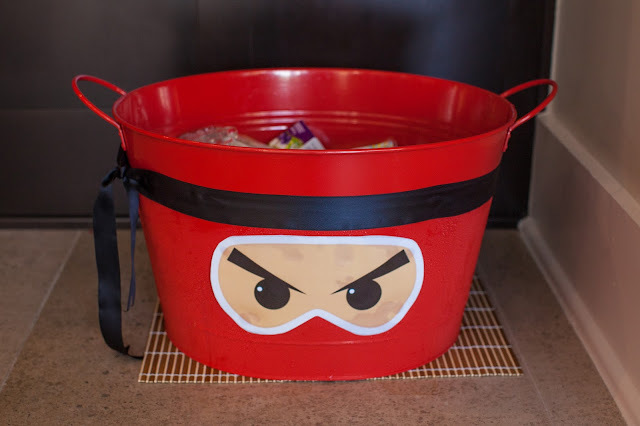 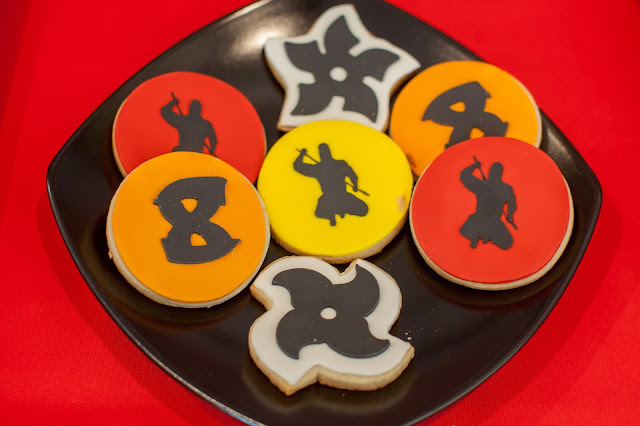 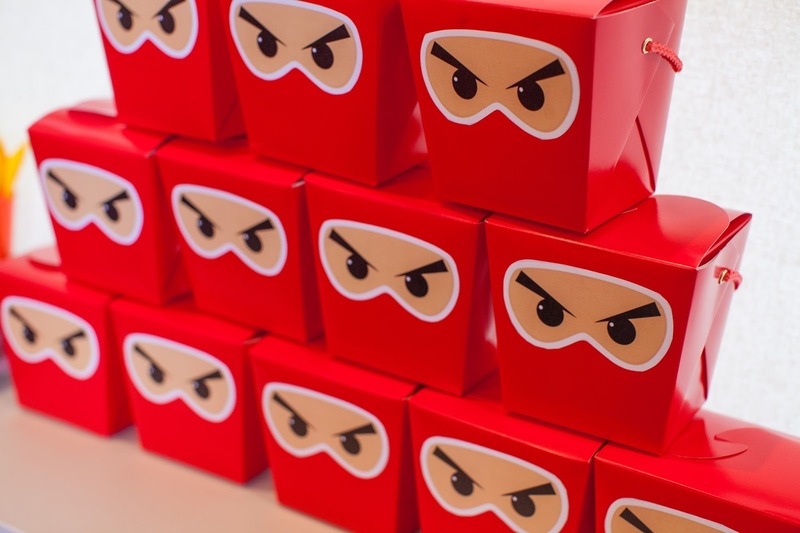 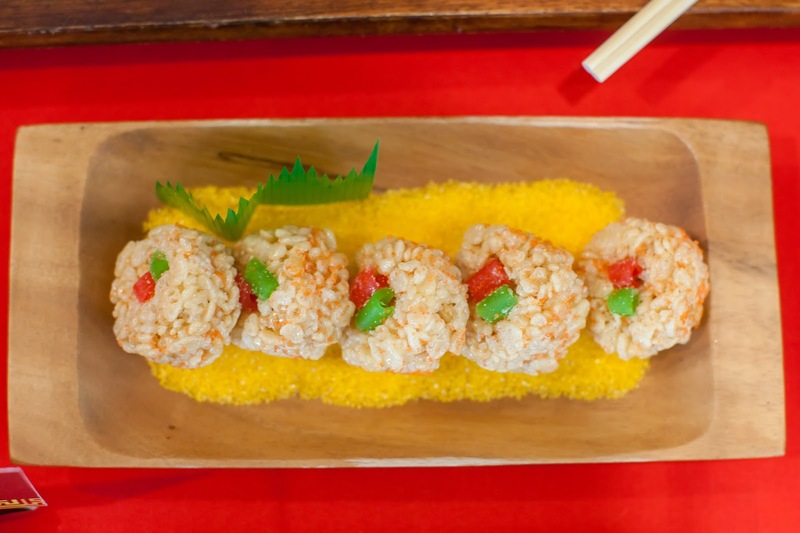 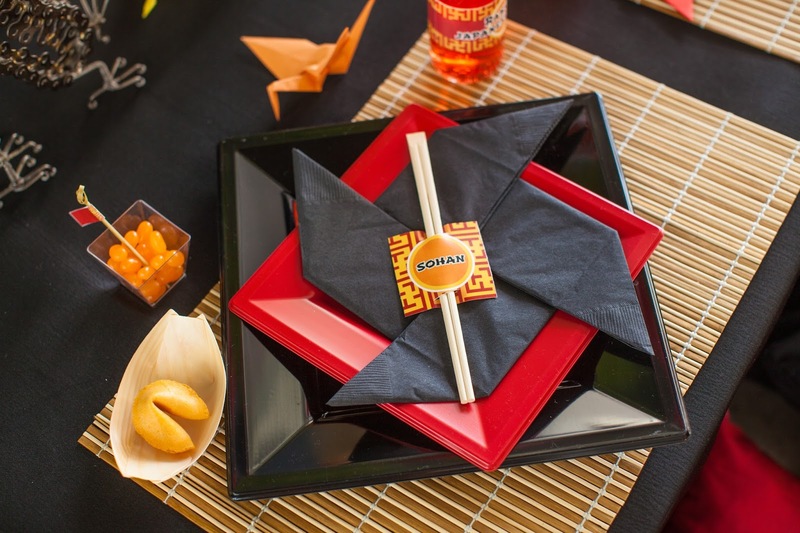 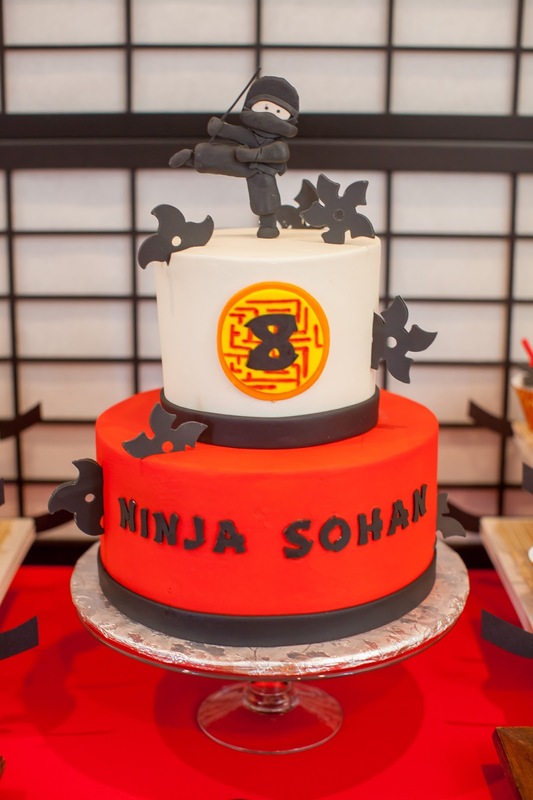 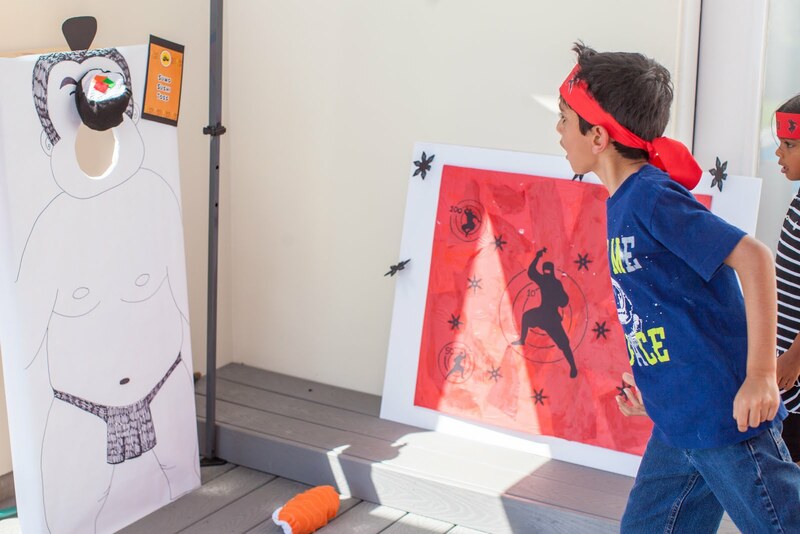 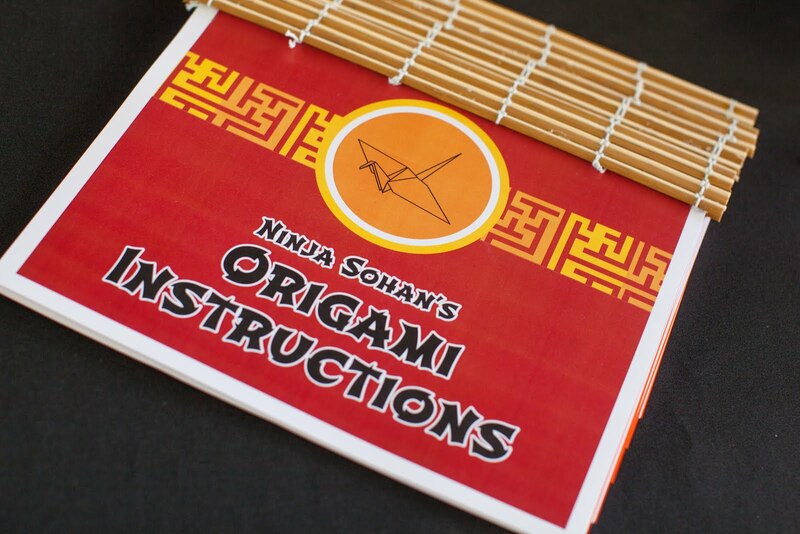 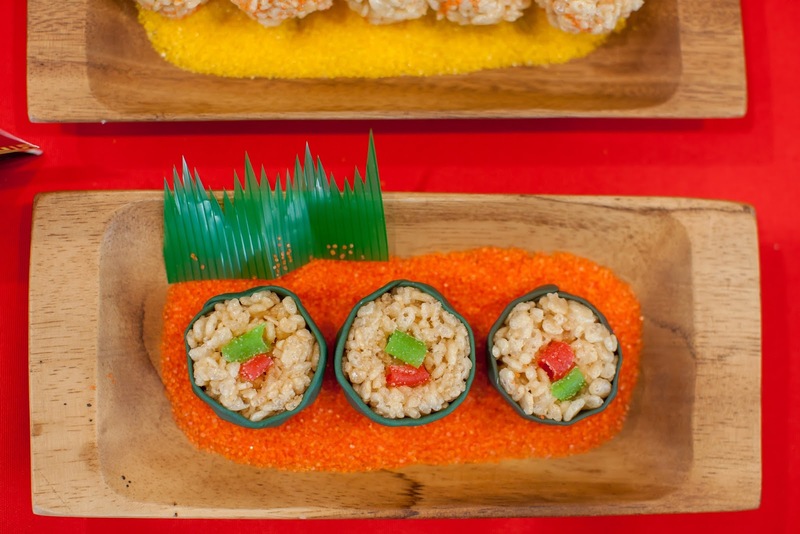 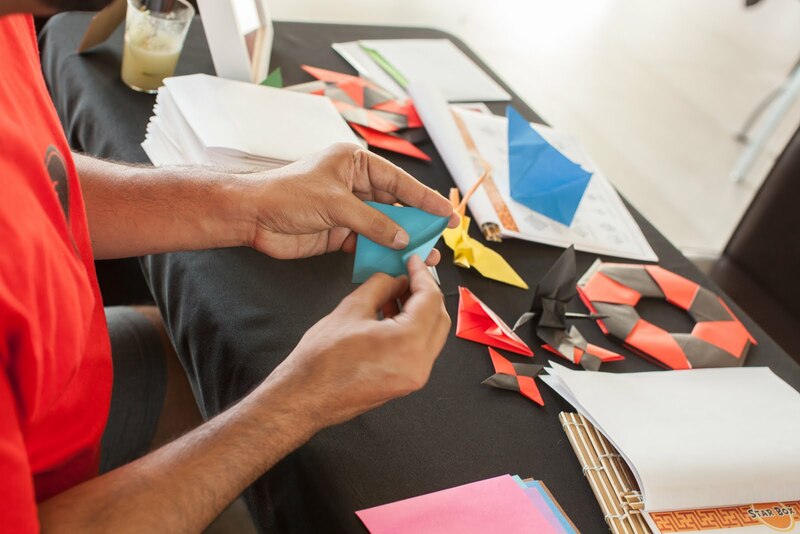 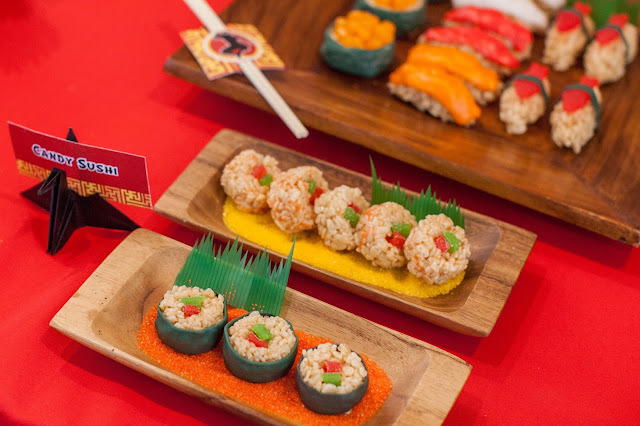 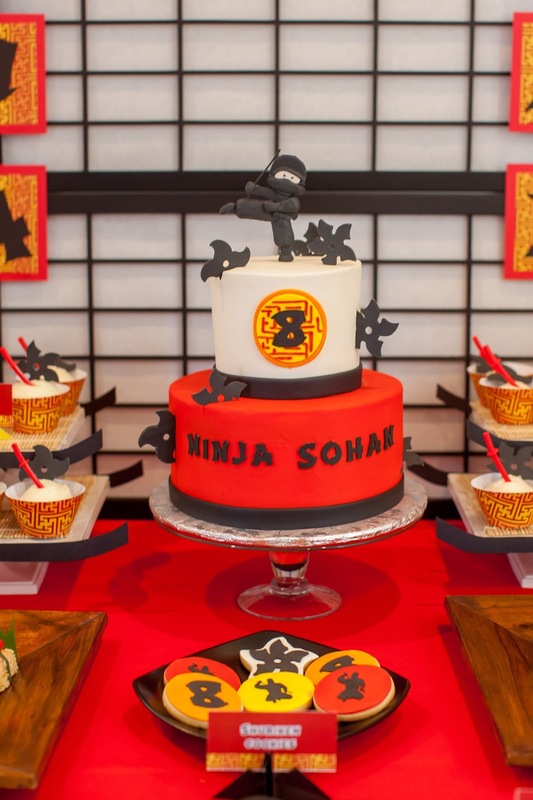 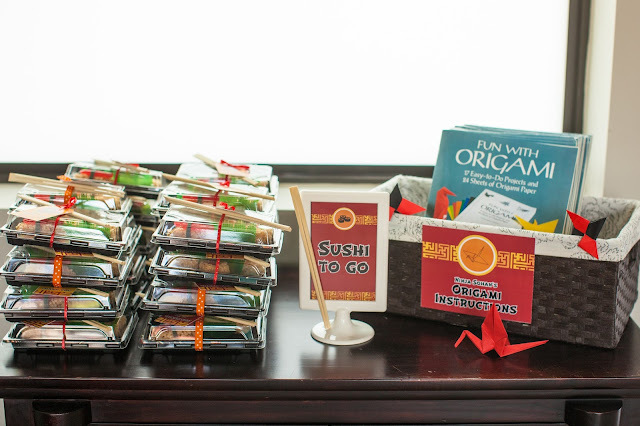 Origami, Ninjas and Sushi…that’s what the birthday boy likes—the perfect combination for a Japanese-inspired birthday party that was fun….and very educational! 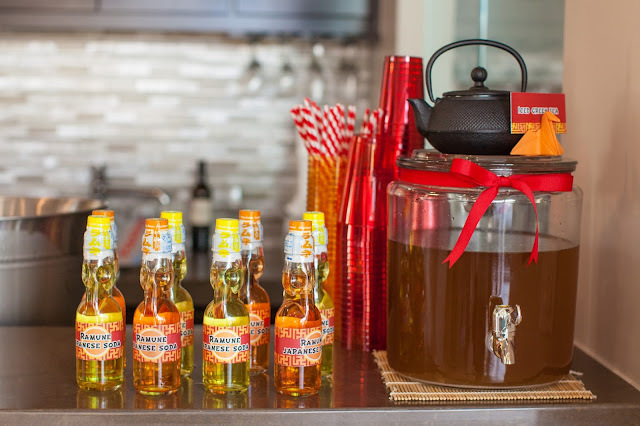 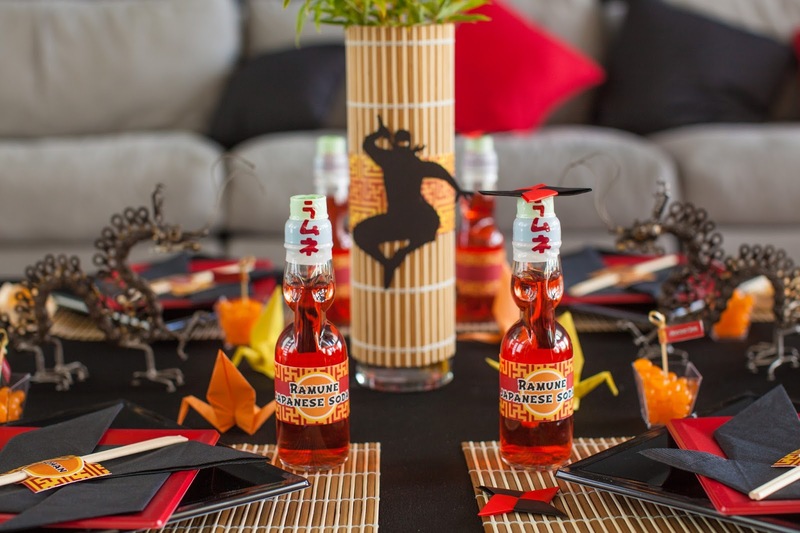 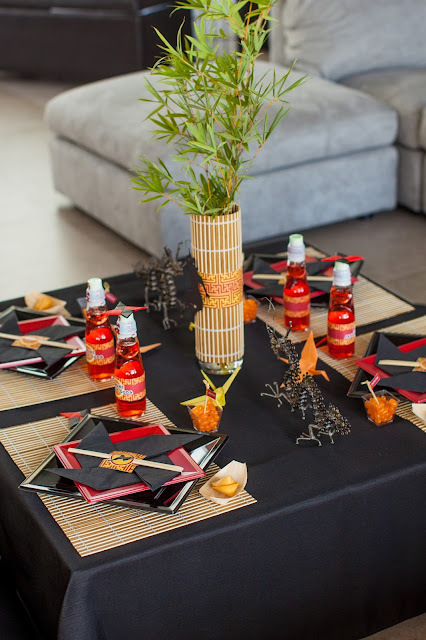 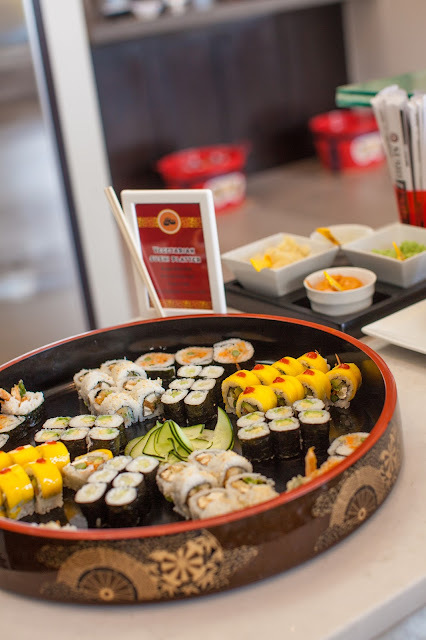 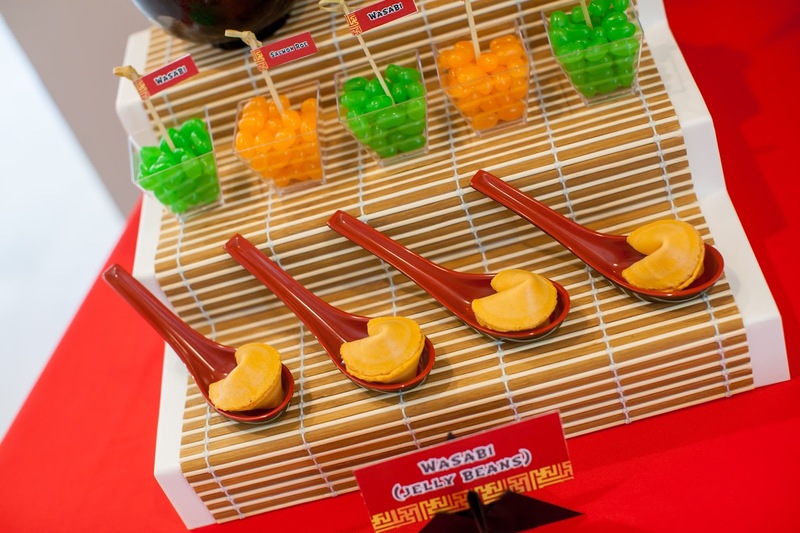 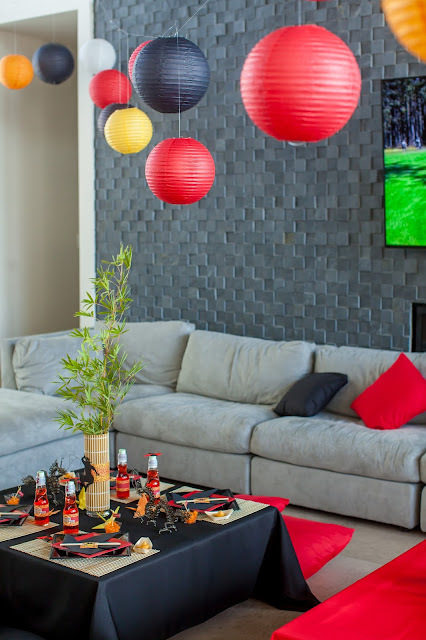 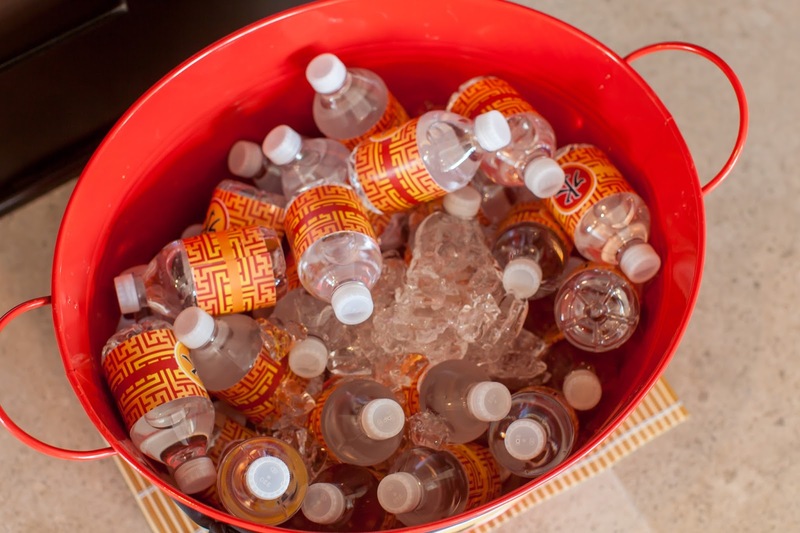 I chose a contemporary Japanese theme with a bold color scheme of red, orange, yellow and black for this party. 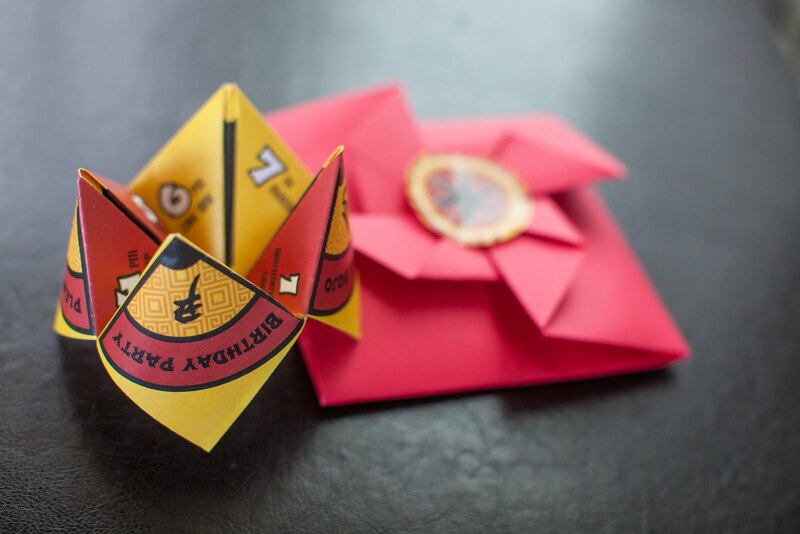 The invitations consisted of personalized origami paper fortune-tellers, delivered in origami envelopes. 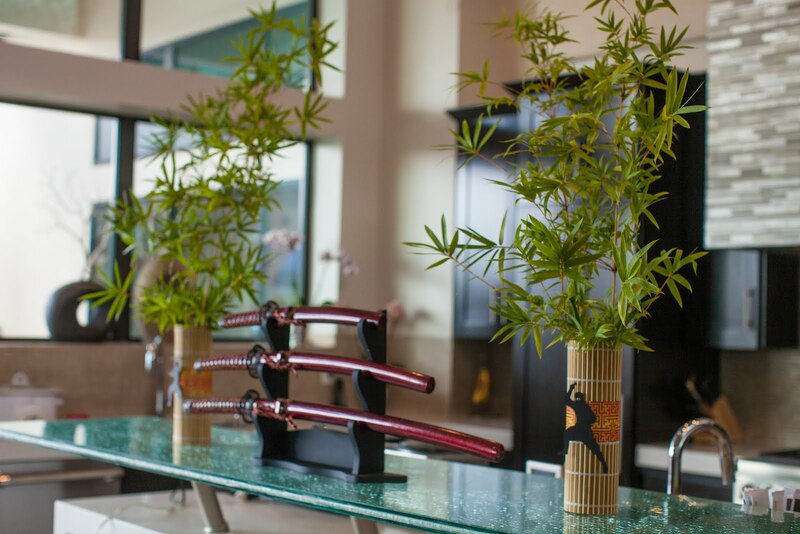 Décor included bamboo centerpieces, created using live bamboo from our garden. The bamboo was placed in vases wrapped with inexpensive bamboo placemats. 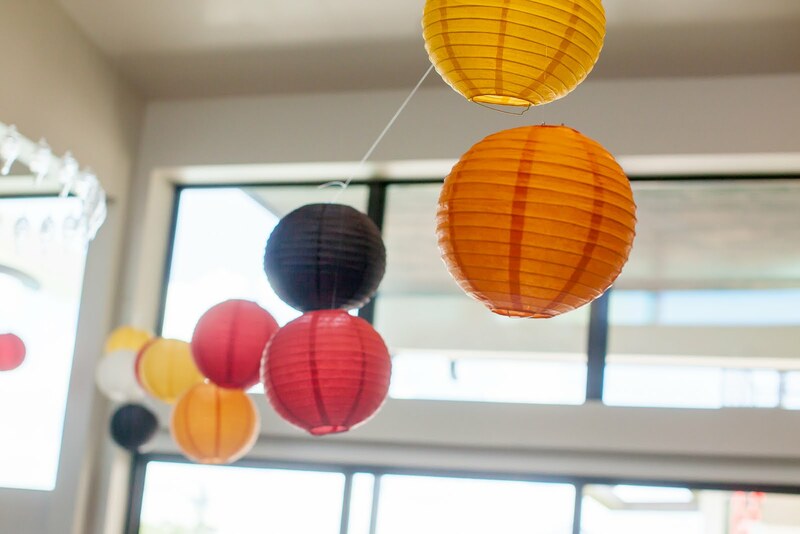 We hung paper lanterns and origami paper cranes throughout the party area and used rice paper screens as backdrops. 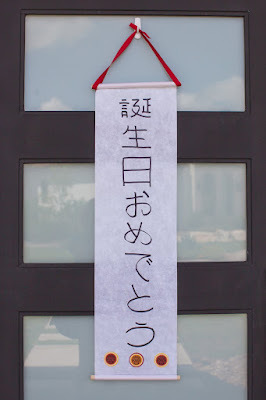 A banner reading “Happy Birthday” in Japanese was hung on the door. 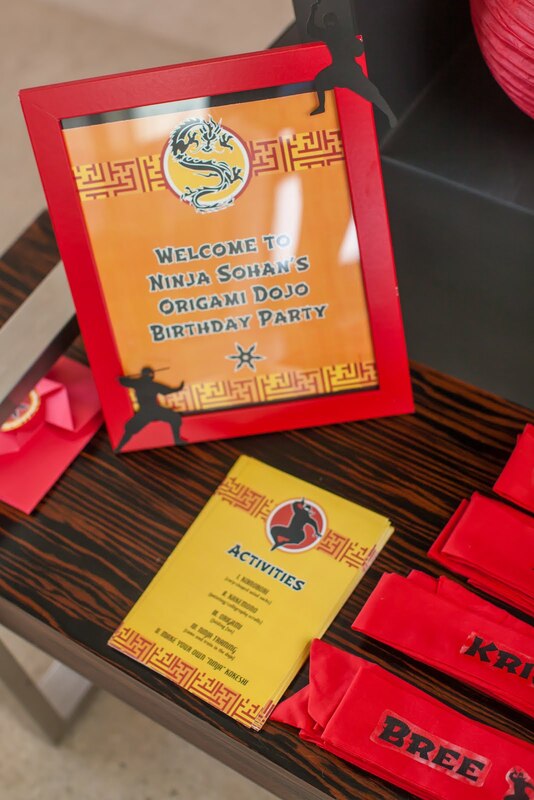 Upon arrival at the party, the children were given a personalized ninja headband to wear. 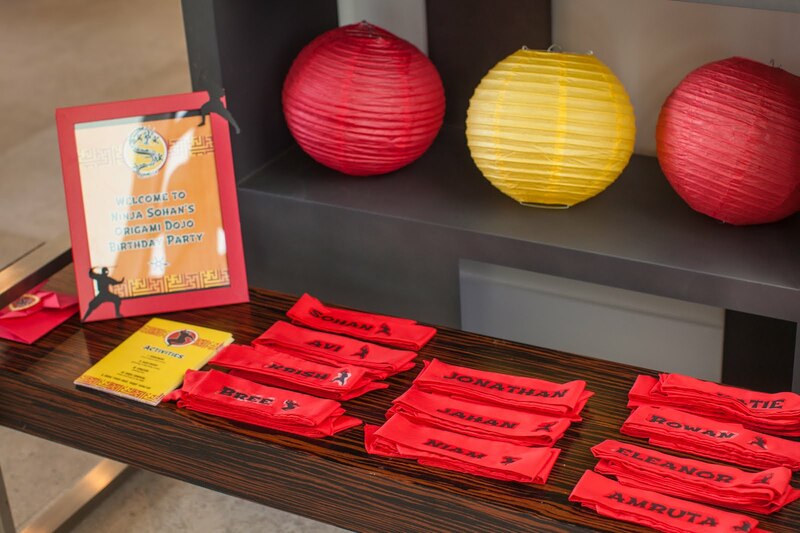 They all looked so cute in their headbands! 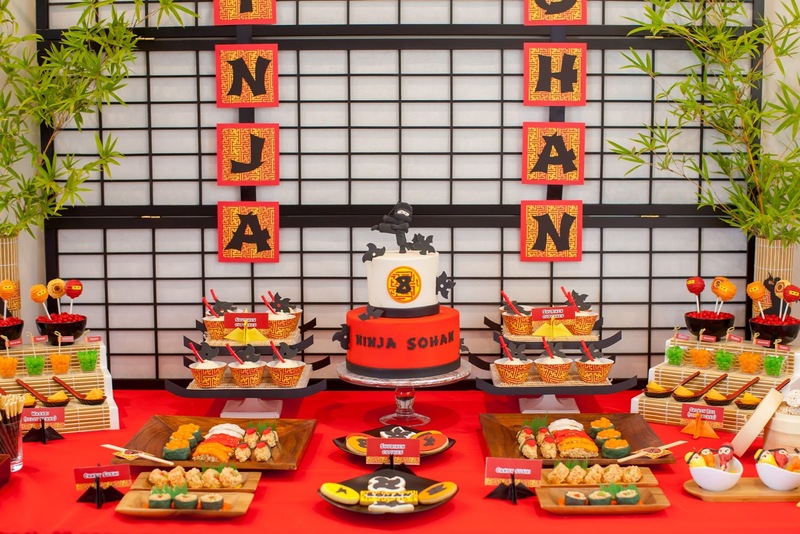 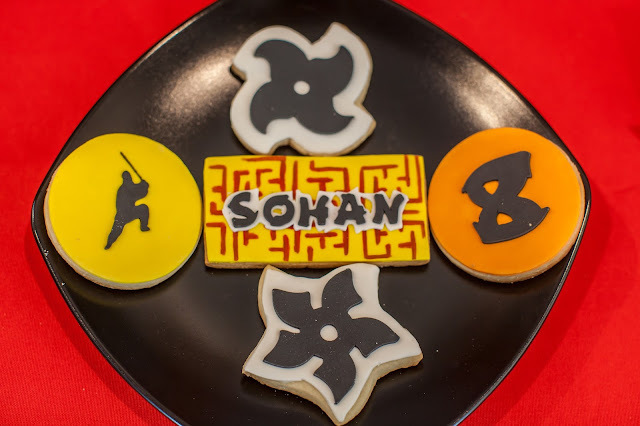 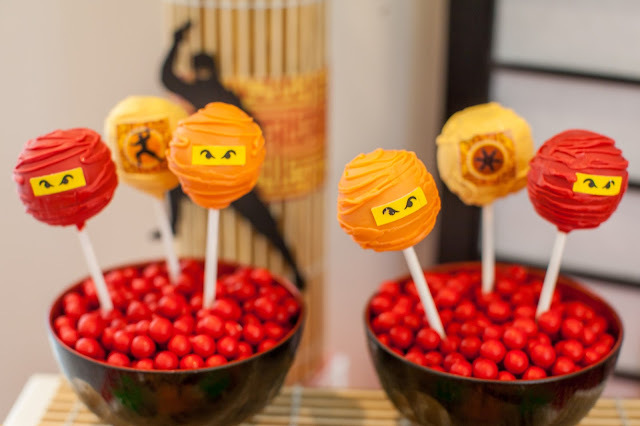 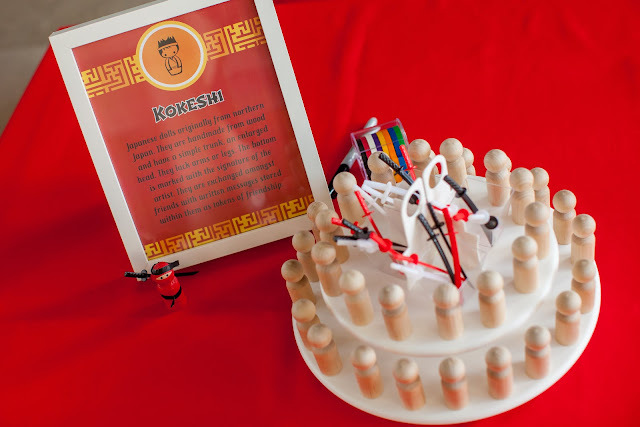 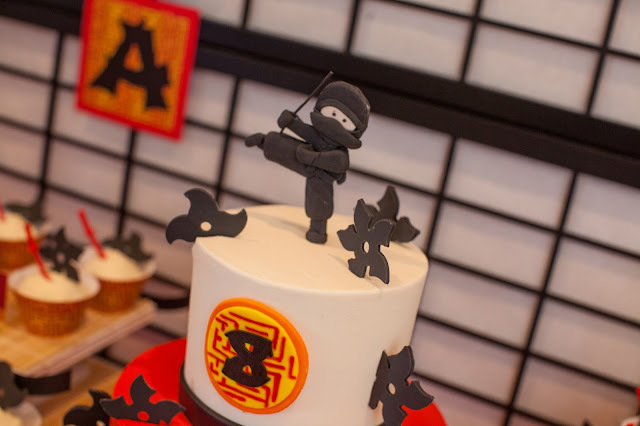 In addition to a ninja birthday cake, the dessert table included shuriken cupcakes, shuriken and ninja cookies, ninja cake pops displayed in Japanese bowls, candy sushi made from rice cereal, ninja lollipops, fortune cookies displayed in Asian spoons, jellybeans (doubling as Salmon Roe and Wasabi), and rice crackers served in a bamboo steamer. 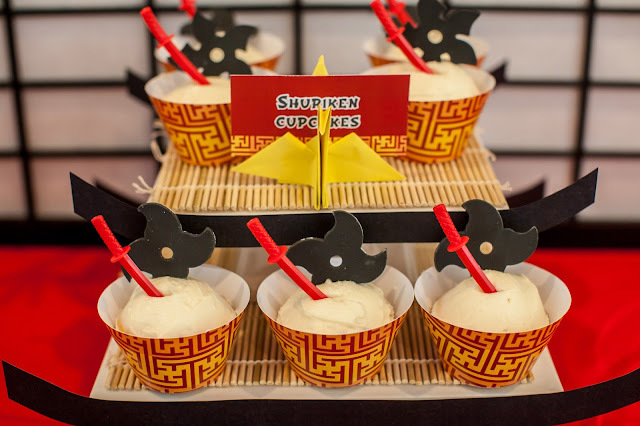 I gave the cake stands a little Asian flair by adding black cardstock to mimic curved Asian rooflines. 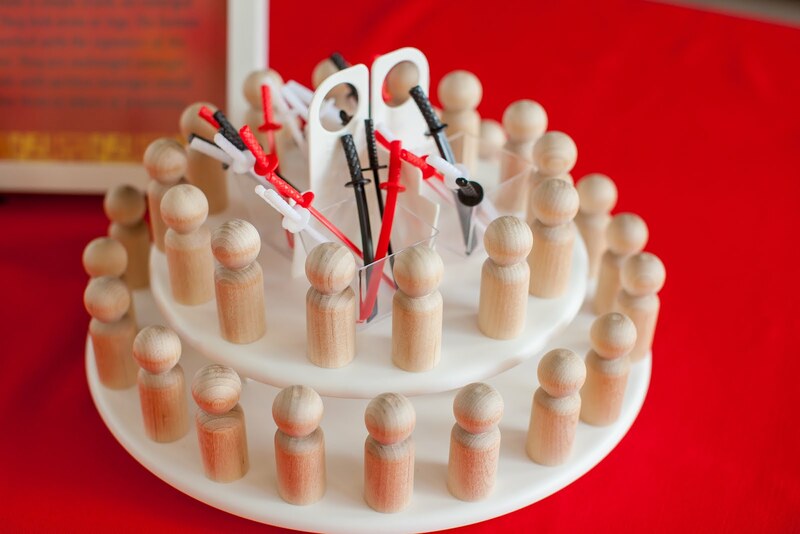 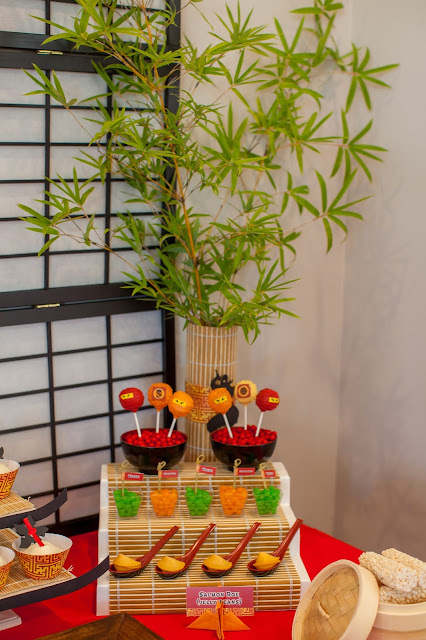 The cake pops, jellybeans and fortune cookies were displayed on stands that I created using can racks (from my pantry!) topped with bamboo placemats. My favorite element of the dessert table was the Japanese candy station—I bought various Japanese candies and chocolates at my local Asian market and displayed them in a Bento box. 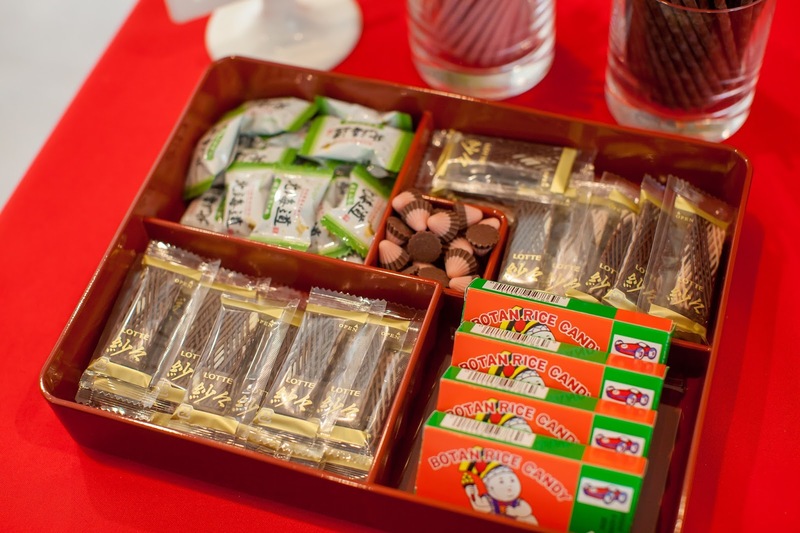 The children loved trying new treats that they’d never had…as well as old favorites like Pocky! 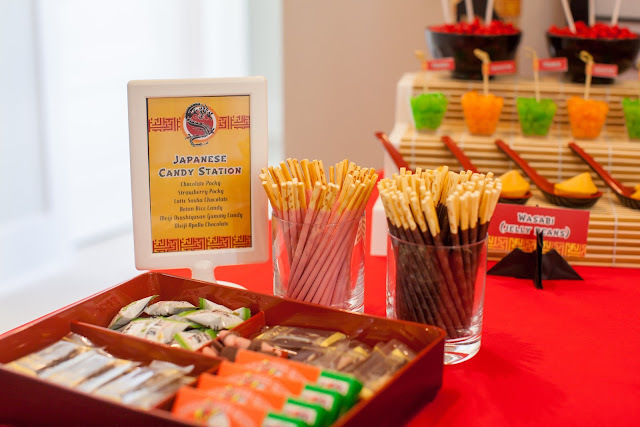 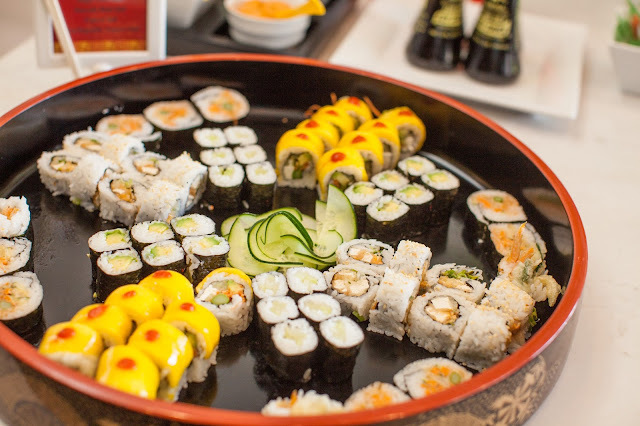 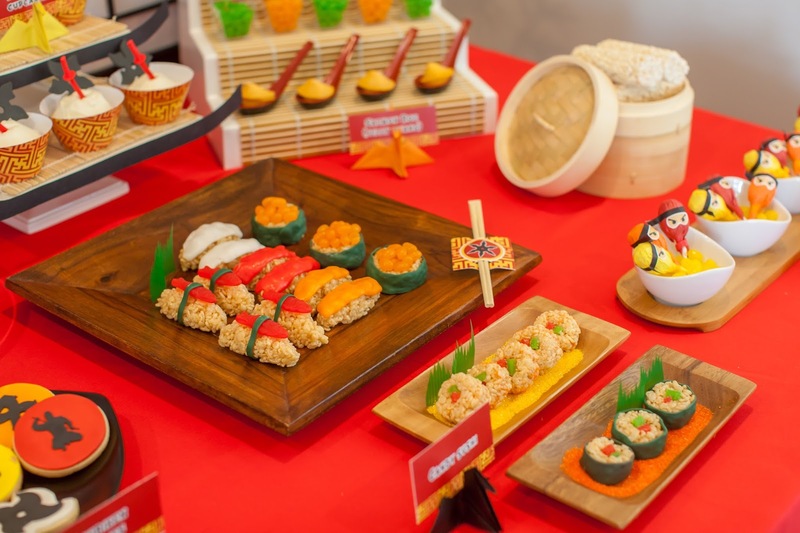 The Japanese theme was continued in the food and drinks for the party—no pizza or chicken nuggets here! 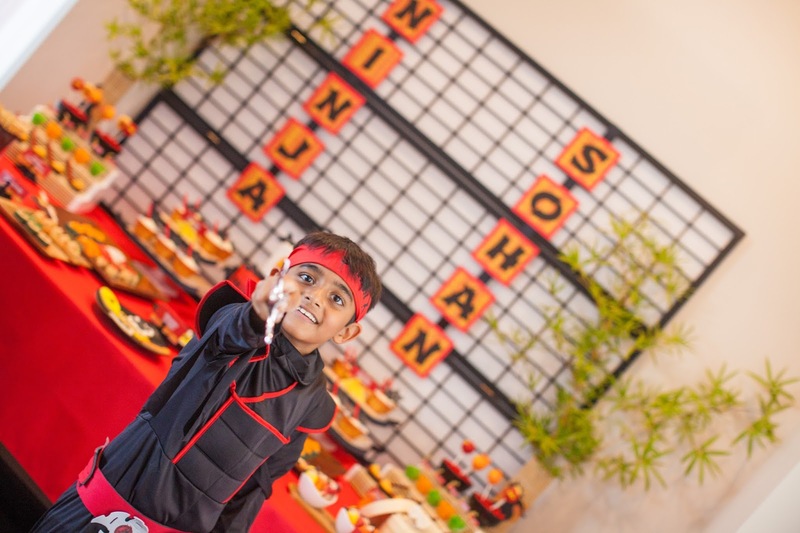 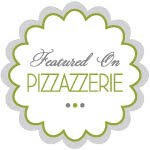 You may be surprised, but all of the children were very excited to try new foods and were extremely adventurous eaters. 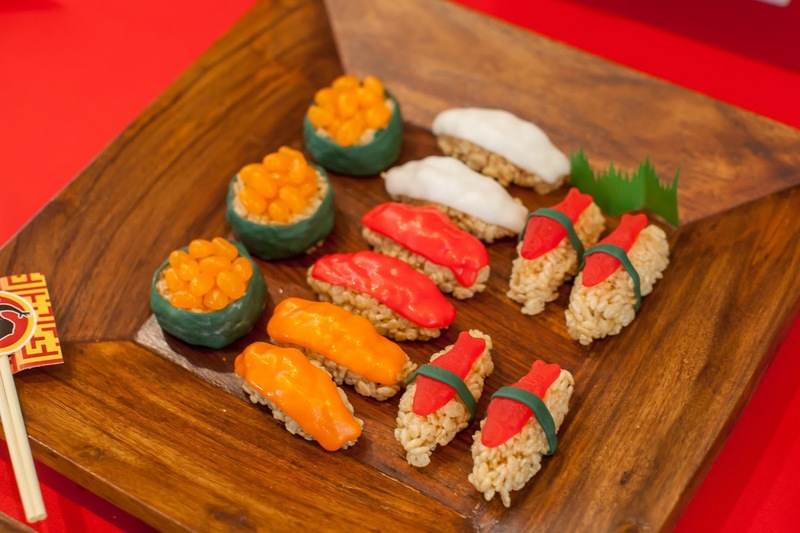 After snacking on snap pea crisps, roasted seaweed, fruit served in wooden boats with bamboo picks, and “anti-sushi” (finger sandwiches rolled into sushi shapes), the children enjoyed a dinner of sushi, udon noodles and chicken teriyaki and got a taste of some Japanese Ramune soda. 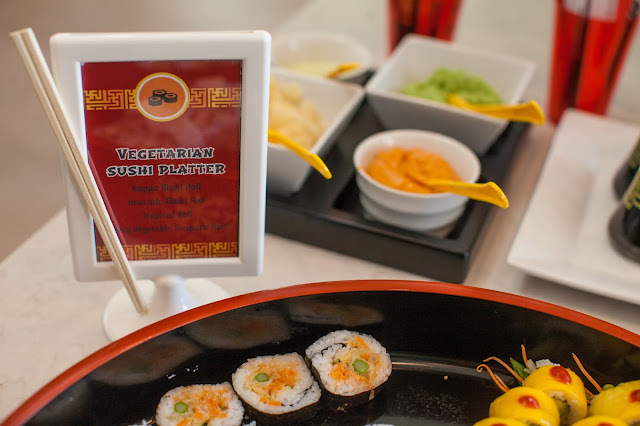 We did have vegetarian sushi for the less adventurous folks! 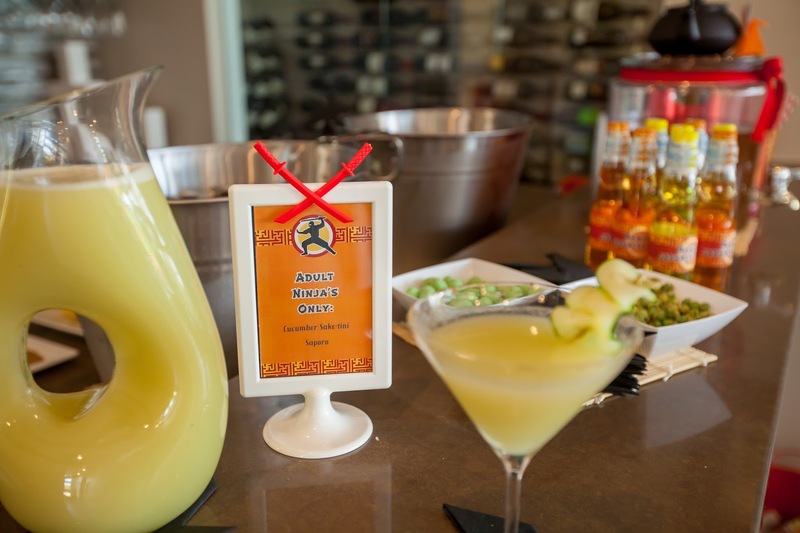 The adult ninjas also enjoyed iced green tea, cucumber sake-tinis and Saporo beer! 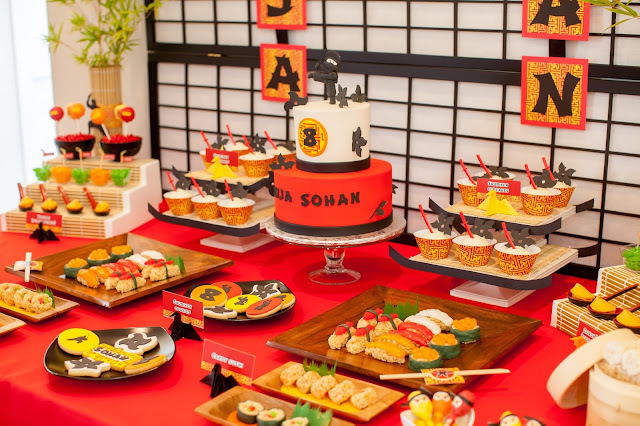 The children sat on floor cushions and enjoyed their meal at low Japanese-style tables. 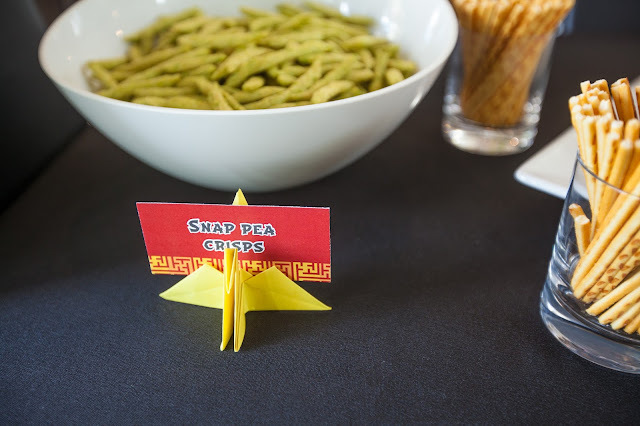 The place settings included paper napkins folded into ninja stars and origami place-card holders! 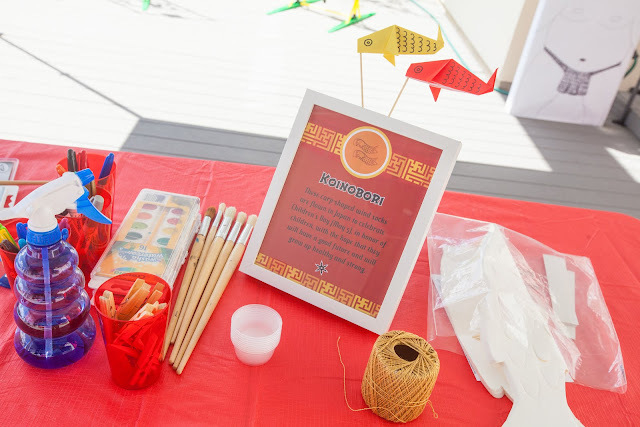 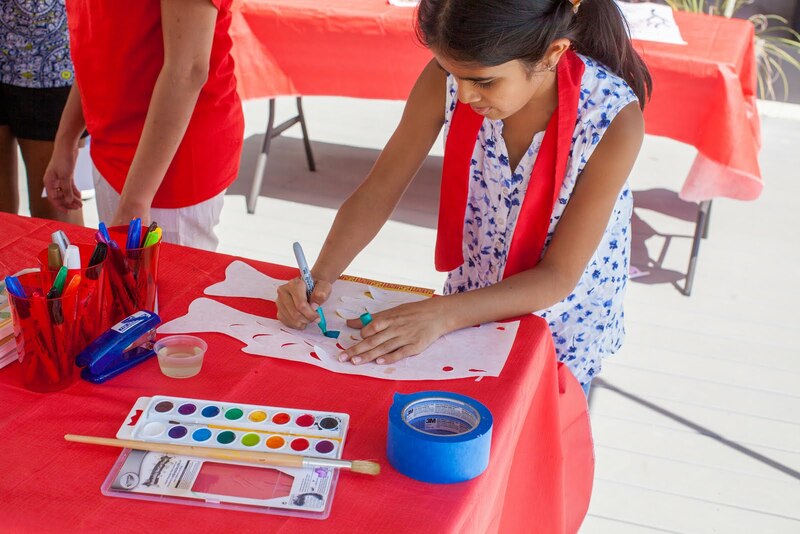 We had numerous Japanese arts and crafts stations set up for the children to enjoy: Origami (the Japanese art of paper folding), Kokeshi (Japanese wooden dolls), Koinibori (Japanese carp windsocks) and Kakemono (Japanese rice paper scroll paintings). Yes, this party required some serious research! 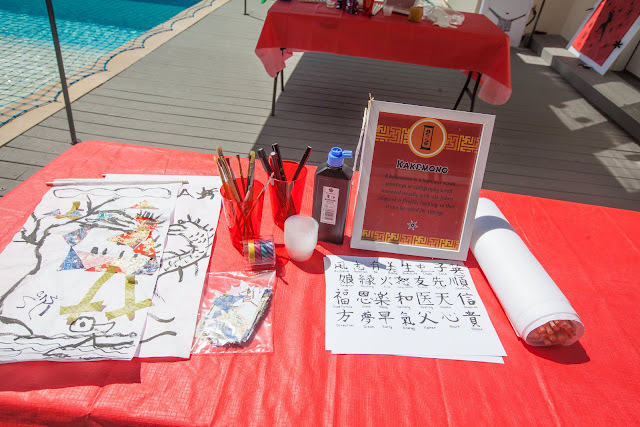 I placed signs at each station explaining the Japanese traditions associated with each craft and the children actually had a great time reading them and educating themselves on Japanese culture. 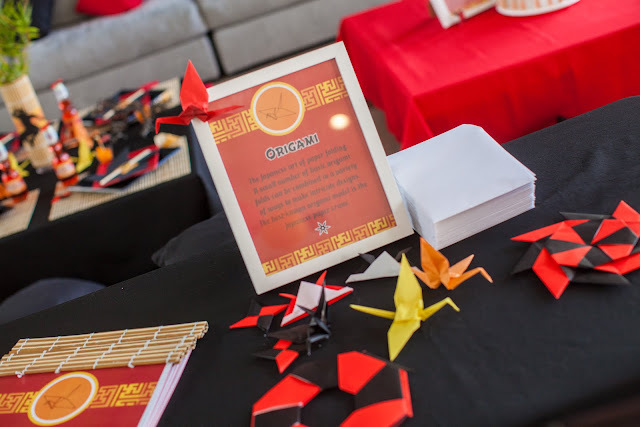 At the origami station, the children enjoyed making ninja stars, transforming ninja stars and Samurai hats, as well as numerous origami animals. The Kokeshi dolls we made were “ninja” dolls, wrapped in washi tape, with ninja sword cupcake picks. 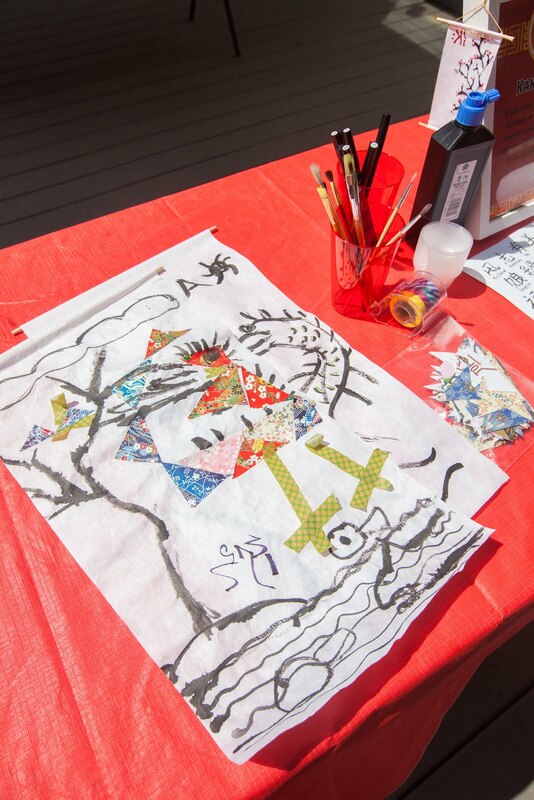 The rice paper Koinibori were decorated with markers, then painted using water colors. We then sprayed the Koinibori with water to make all the colors bleed together. 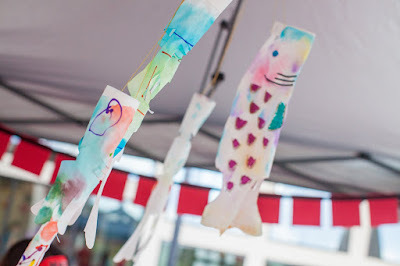 It created really pretty windsocks! The Kakemono scroll paintings were composed of calligraphy using Japanese Sumi ink, scraps of Japanese decorative paper and washi tape. 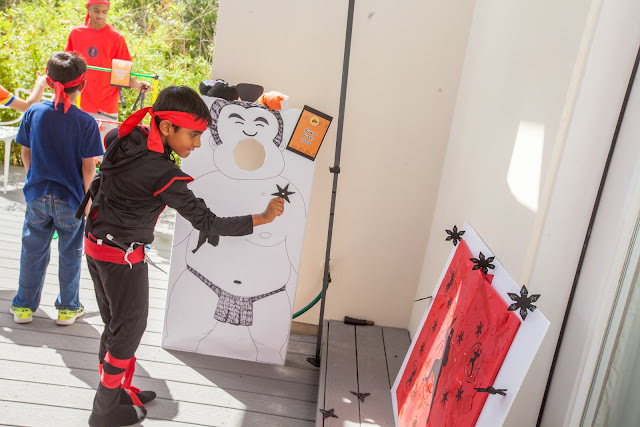 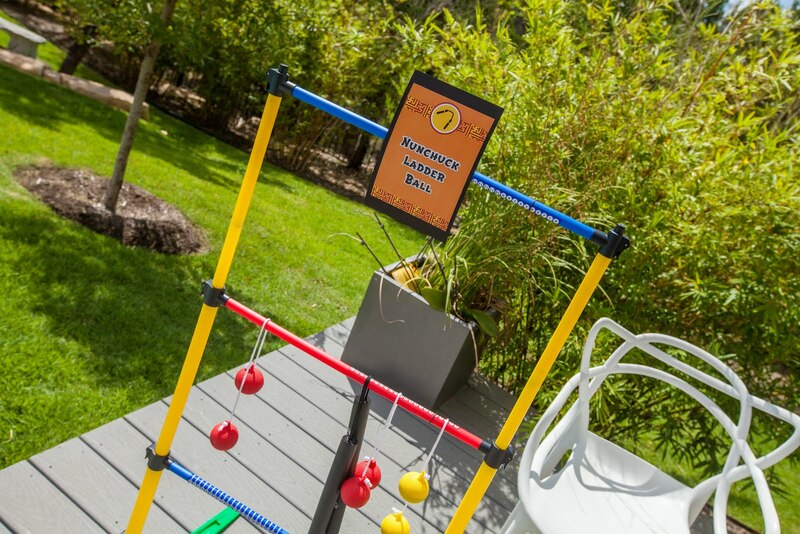 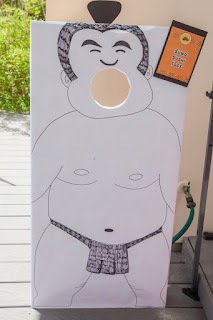 In addition to the Japanese arts and crafts, we also created our own version of a Ninja training station, consisting of Sumo Sushi Toss, Nunchuck Ladderball, Shuriken Target Practice, and the Fastest Chopsticks in the West (we do live in Texas!). 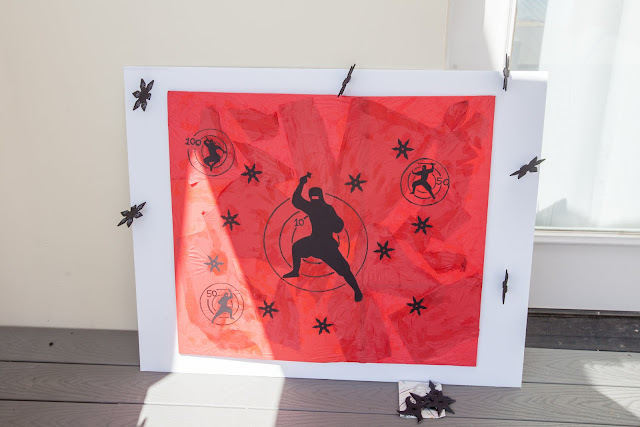 For the target practice game, I bought some rubber shuriken (ninja stars), which were tossed at the foam-backed ninja target. 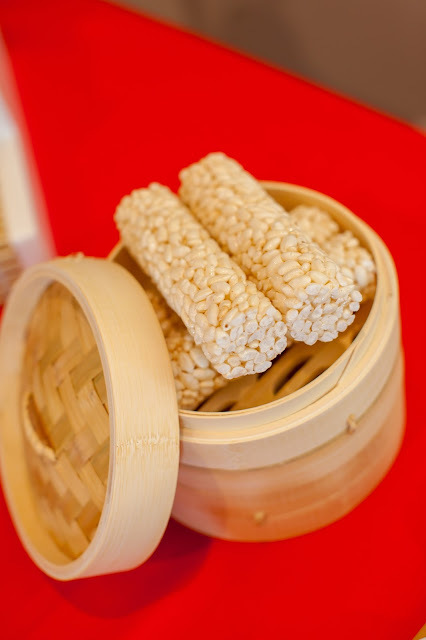 Fastest Chopsticks in the West consisted of racing to fill take-out containers with as many marshmallows as possible in one minute. After a culturally rich afternoon, the children left the party with a “ninja” take-out container full of treats from the dessert table, their own candy sushi to-go and an origami book. 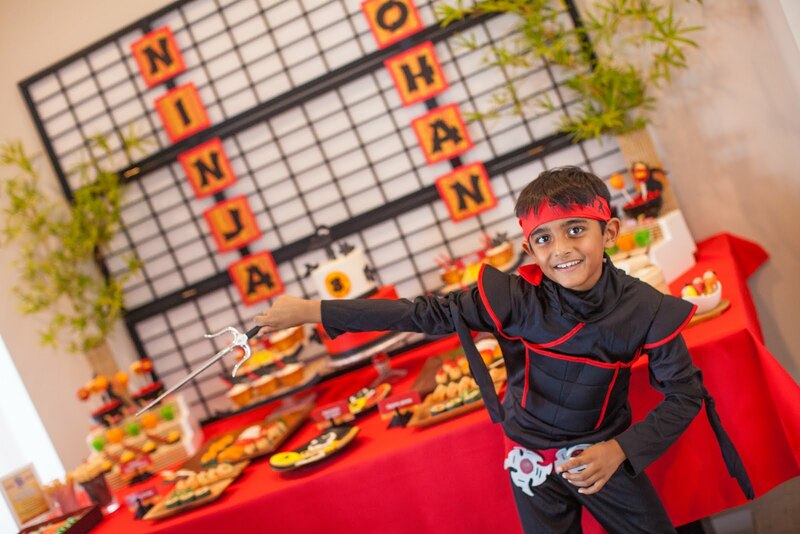 This party was a labor of love and required tons of research, but the children all had a fantastic time and the birthday boy was thrilled with everything…which makes it all worth it! 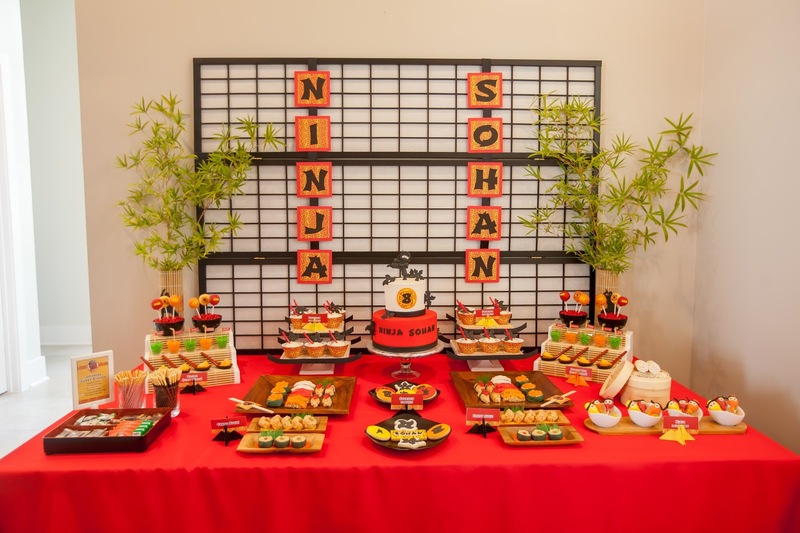 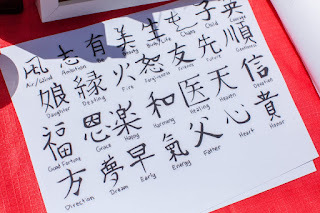 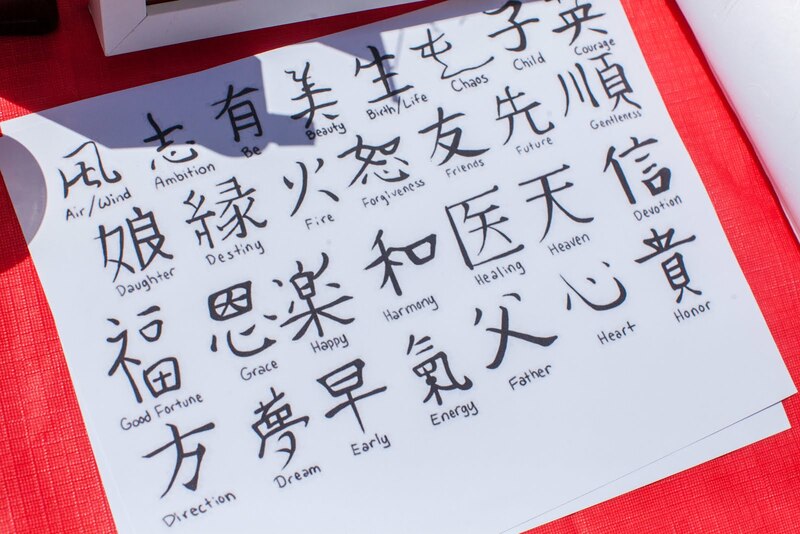 Inspirational Japanese Inspired Birthday Party! Truly loved this party décor. 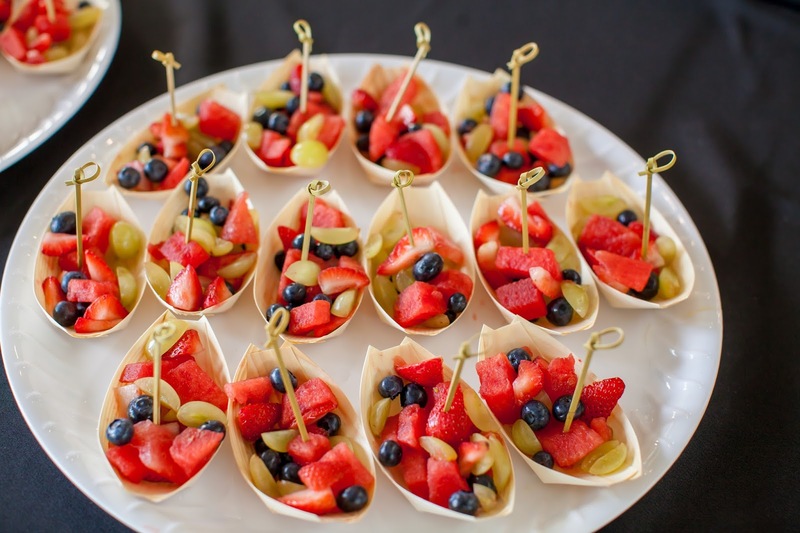 Everything is simply superb. 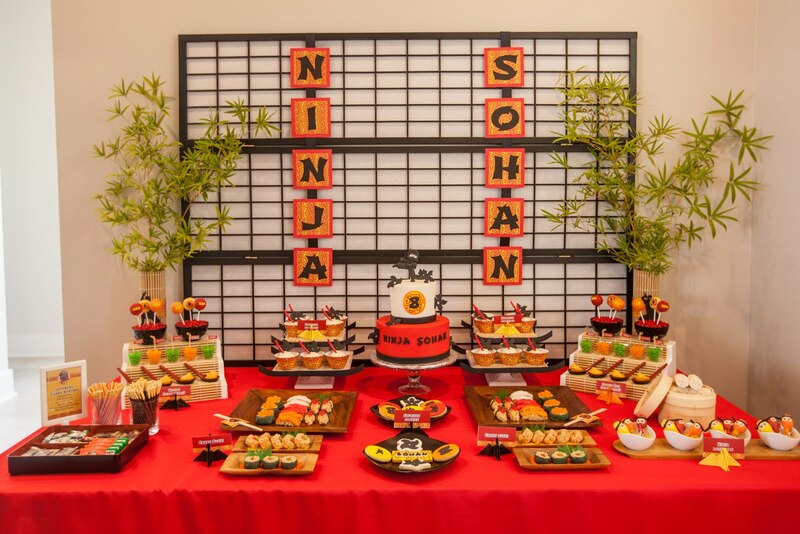 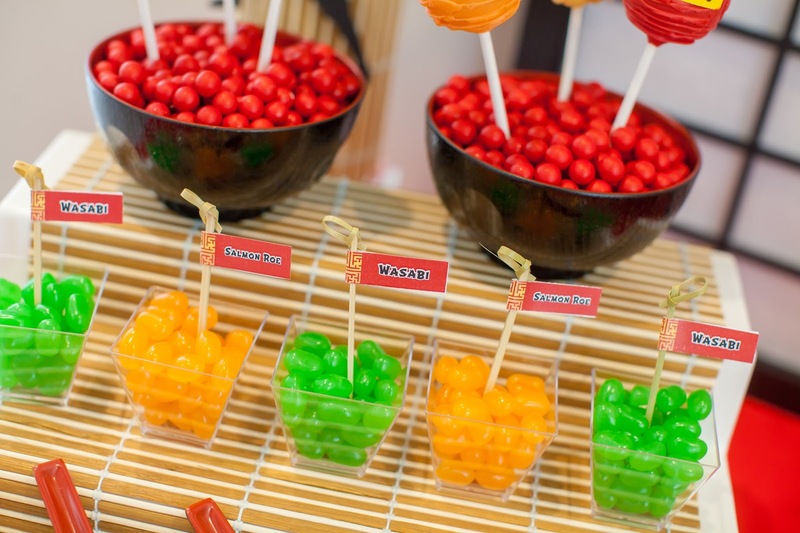 I have to to host my son’s 10th birthday bash and will love to have this theme. 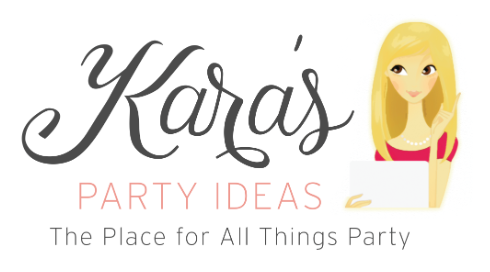 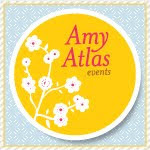 Hoping to find affordable party venues soon.